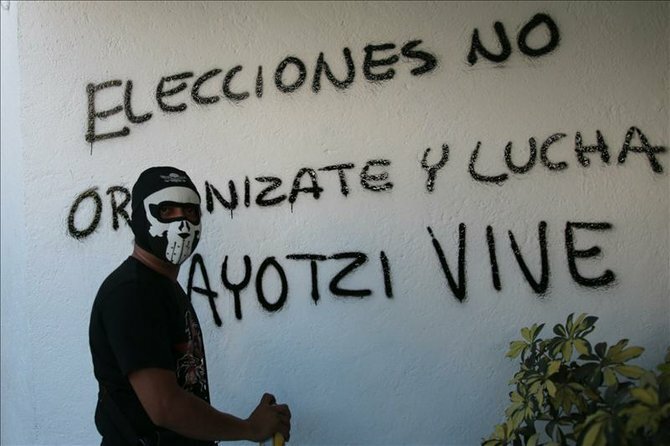 Protester paints grafitti on wall during protest by members of the State Coordinator of Education Workers in Chilpancingo, Guerrero, January 7, 2015. The grafitti says: “No to elections. Organize and fight. Ayotzinapa Lives.” Photo by Luis de la Cruz / EFE. MEXICO CITY — Mexican activists look to rekindle the movement to find the 43 missing education students of the normal school (teacher training school) at Ayotzinapa, Guerrero after the very long holiday period (which still hasn’t ended for many schools) and in light of very shocking information and allegations. Parents and fellow students are convinced that the federal government’s explanation of what happened — that the municipal police of Iguala turned the students over to members of a mid-sized drug gang who, in turn, burned them and buried them in a nearby landfill — is not credible and that federal forces participated in every step of the attack, detention, and cover-up. During the Christmas period, when it was not feasible to organize mass demonstrations, families of the disappeared confronted military officials at base entrances, blocked highways, detained the mayor of Acapulco in his car (to thwart efforts to promote tourism in Guerrero as a means of making everything look normal), and headed small marches in Mexico City on December 26 and on New Year’s Eve. The latter march had as its destination the presidential residence, but hundreds of police blocked the way, and parents and others spoke at another spot on the street. Evidence appeared almost from the beginning in the form of testimony from Omar García, one of the few students who escaped from the clutches of the police. He detailed how military personnel insulted the students the night of September 26 with comments like, “You think you’re little men. Now you’re gonna get fucked over, so take the consequences like men.” They also prevented injured students from getting medical treatment. More damning evidence comes from Anabel Hernández and Steve Fisher, fellows at UC Berkeley, who have published a series of articles in the Mexican weekly magazine Proceso since December 14. (Most copies of the issue containing this first installment were bought and destroyed by government minions.) Hernández is also a reporter for the Mexican magazine Proceso. Fisher has since been featured in The Nation and on WBAI-FM in New York. reported on by Democracy Now!, January 6, 2015. The federal government took control of law enforcement in Guerrero months before the incident. All emergency calls and dispatching communication to and among local and state police is received simultaneously by the Federal Police, according to Natividad Elías Moreno, one of the dispatchers. While the federal attorney general asserts that a dispatcher named David Hernández Cruz testified that then-mayor of Iguala José Luis Abarca ordered the attack, there is no dispatcher by this name. In the second armed attack against the students that night, several witnesses and one video in possession of the reporters indicate that municipal police shot first, but that, when students attempted to move a squad car that was blocking the buses, federal police came in, shot, killed one student, injured others, and picked up their spent cartridges so as not to leave any evidence. On the scene of this attack, various witnesses describe equipment like knee pads, helmets, and even a mount for a machine gun, which the Iguala police do not possess. After the fourth attack, clothes left behind by the students were soaked with blood and residues of tear gas, which the Iguala police also don’t use. The civilians who “confessed” to having killed the students were tortured. Raúl Núñez Salgado, a small business owner, was arrested October 16 and accused of being a leader of Guerreros Unidos, the gang that supposedly killed the students. A police form that speaks of his physical condition before his deposition was taken states that he had internal hemorrhaging in his eyes, marks indicating blows to his ears, and 12-centimeter-long bruises on his cheek. Carlos Canto, teacher and bar owner, was beaten and tortured with electric shock by the navy and forced to testify against other teachers (on a list submitted by the police) and against Abarca. The reporters detail five similar cases. San Juana Martínez is an investigative reporter based in Monterrey who has specialized in cases of gender violence but has recently focused on the political violence in Guerrero and Michoacán. She published in the newspaper La Jornada in recent days an interview with Jorge Antonio Montemayor Aldrete and Pablo Ugalde Vélez, physics professors at the national university, in which they debunked the theory of the open-air incineration of the students (to the extent that no clothes or bones remained) and speculated that they could have been burned in cremation ovens operated by the army. The army first denied and later admitted to having cremation ovens. The army first denied and later admitted to having cremation ovens. Subsequent investigation (reported in a new article by San Juana Martínez in the January 11 issue of La Jornada) revealed an agreement between the army and the ISSSTE, the agency that provides social security for public employees, in which army personnel who choose to be cremated can also use ISSSTE facilities for that purpose. The professors, perhaps ingenuously, demand that the army reveal who used army and ISSSTE facilities in this time period, how much gas it bought, etc. 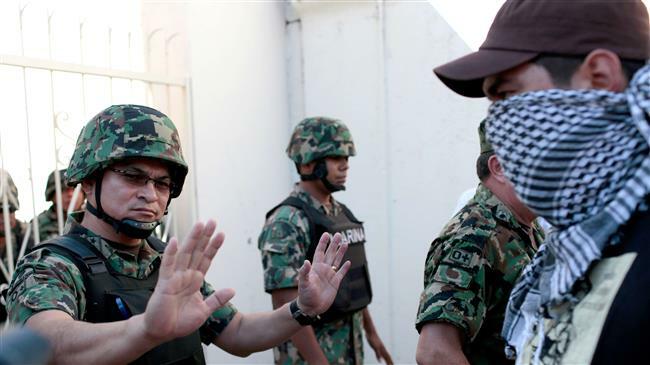 Mexican soldiers block protesters at military base in Guerrero, January 12, 2015. Photo by Pedro Pardo / AFP. Gallardo showed Martínez a document stating that the military prison in question was created to jail dissidents (civilian more than military): “I found this document in the prison library, where they sent me as punishment. Give me a break. In fact, it was said that in that crematorium they incinerated people during the student massacre of 1968.
Who can carry out that kind of disappearance? Everything points to the army. The first day, I said it was the army. They’re the only people responsible, because they have the whole state militarized. Who’s ultimately responsible? The supreme commander of the armed forces, Enrique Peña Nieto… The government has the rural normal schools catalogued as nests of dissidents…. This is the extermination of a specific group of the population. cause of the 43 students. Some activists pin their hopes on a constitutional convention process similar to the one carried out 100 years ago in Mexico, rooted in the Revolution, and much more recently in several South American countries. Skeptics on the left point out that the Mexican constitution has aspects that are, on paper, progressive: Mexico was the first country in history to have labor rights constitutionally guaranteed, but the minimum wage is about five dollars a day, most people work far more than 40 hours a week with no overtime pay, and most unions are submissive to the government. Mexico was also in the vanguard in terms of the constitutional right to an education, but 7.5 years of formal education is the norm, there is no place for many aspirants in a high school and the overwhelming majority of people seeking to go to college have no opportunity to do so. Said skeptics cite these examples to demonstrate that laws are not enough. What appears to be the obvious involvement of officeholders of the Partido de la Revolución Democrática (until recently still seen as a left-leaning party by some) in the murder of some of the students and the disapparance of 43 on September 26 and 27 has accelerated the process of disillusion with that and similar, smaller parties and with the electoral process itself. Since then, the mayor of Iguala has resigned (and is now incarcerated) and the governor (who let the mayor flee) has taken a leave of absence. Both were elected as “external candidates,” that is to say, they were business figures who were not members of the PRD. The same is true of Miguel Ángel Mancera, mayor of Mexico City accused of orchestrating or condoning countless incidents of police brutality since he took office in December 2012. A recent incident occurred in November, when a few local police entered the main campus of the Universidad Nacional Autónoma de México without authorization (note the third word in the name of the university) and ended up shooting at students of the department of literature and philosophy and injuring one. The mayor and rector of the university both took about two days to realize that, in order to save face, they had to pretend that this was an aberration of a few zealous officers, who were then fired or reassigned. Though Mancera has not been accused of atrocities of the magnitude of those that officials and former officials in Guerrero face, his right-wing orientation has helped to discredit the PRD, as have numerous local scandals involving financial improprieties of many PRD officeholders. All this comes after three presidential elections in recent history that were widely regarded as stolen. Carlos Salinas (1988), Felipe Calderón (2006), and Peña Nieto (2012) took office amid widespread accusations of misconduct by candidates, parties, and government and, especially in the first two cases, the belief that they received fewer votes than their nearest opponents. More moderate activists, like writer Javier Sicilia who founded the “Estamos hasta la madre” movement after his son was murdered in Cuernavaca, are also calling for electoral abstention. The intrusion of local police into the national university (UNAM) was one of many provocations that appear to be clumsy acts carried out by a few individual police or soldiers, but that together form a pattern: commanders or elected officials order an act of heavy intimidation and, if it doesn’t go as well as planned, find scapegoats and wash their hands. For November 20, the anniversary of the Revolution, several events were planned: marches in various cities, the arrival for the march in Mexico City of three caravans of family members that had toured the country, and the takeover of various airports. Students of several schools decided to attempt the action anyway, with the result that fewer than 200 young people took over one of the main highways leading to the airport but were soon outnumbered by police. A minority of the crowd, many of whom self-identify as anarchists, decided to taunt and in some cases attack the police, despite a previous agreement to avoid such confrontations. Several students were arrested near the end of the demonstration after many had already seen the action as futile and had left. Three hours later, the peaceful march began from three strategic points, heading to the central square, the Zócalo. It was impossible for all participants to fit into the Zócalo and estimates are that 200,000 people attended. (Police and mainstream media obviously released lower figures.) Around 10 at night — again, after most people had left — local (PRD) police began, with or without minor provocation, to arrest and beat people at random, victimizing people carrying small children, dragging people out of bars and cafés, fomenting panic. People arrested during both November 20 demonstrations were turned over to federal authorities and sent to distant prisons. Anarchist-baiting such as had not been seen since the Haymarkets riots in Chicago in 1886 was the order of the day. During these days, anarchist-baiting such as had not been seen since the Haymarkets riots in Chicago in 1886 was the order of the day. Even relatively progressive media like Proceso ran bizarre reports, leaked by the Mexico City red squad, about “anarchists” and which schools they attended, which political parties they belonged to (like anarchists would belong to political parties), and who their gurus were. Video showing the abduction of Sandino Bucio. In the midst of campaigns to free the recently-imprisoned and the debates about tactics that are part of any mass movement, Sandino Bucio, a literature student and poet associated with the YoSoy132 movement of 2012, was kidnapped by four plainclothed men as he walked from the national university to the nearest Metro station. (See video above.) They stuffed him into a nondescript, unmarked car, forced his legs in, closed the door, and drove off. Some witnesses yelled insults at the kidnappers, filmed them, and got their license plate number, but none tried to intervene physically. This was at 5 p.m., still daylight, a Friday afternoon, on a route with very heavy pedestrian traffic and a population known to be left-oriented. The video circulated on Internet and, within a few hours, it was confirmed that the kidnappers were federal police and had taken Sandino to the SEIDO, a unit that specializes in “organized crime.” The word was that he was wanted for something he was accused of having done on November 20. Two contradicting needs were then expressed by many: 1. We have to go down there. 2. What if we were there that day and they bust us, too? Only about 200 people showed up at the centrally-located SEIDO, but he was released within hours, evidence of beating on his face, and the “loose cannon” officers were soon fired. The incident had a chilling effect on many, though the federal government, curiously, announced that most of the November 20 detainees would also be released (some on bail, some with no charges). Internet organizing was reduced to a minimum. Sandino, a well-known, photogenic figure, appeared on a local radio show and defended confrontational tactics against police and other symbols of government repression. Internal debates ensue about this, but not very publicly. The day that Sandino was detained, soldiers entered the autonomous university of the northern state of Coahuila. The day that Sandino was detained, soldiers entered the autonomous university of the northern state of Coahuila, burst into some classrooms, wandered around for awhile, made noise, and left. Again, according to military spokespersons, no one ordered this; it just happened. A few wayward soldiers. Days earlier, the state education department of Chihuahua ordered that classes be suspended till January, that is, that vacations begin more than a month early, in the schools it controls and in some that it doesn’t, like the autonomous universities of Ciudad Juárez and the city of Chihuahua. Both Chihuahua and Coahuila border on Texas. The three universities mentioned in these states had, surprisingly for some, become hotbeds of activism. The pretext for shutting down schools in Chihuahua was that it was “too cold.” It was only mid-November: students protested the next day, mostly without jackets and, of course, showing no signs of goosebumps or frostbite. Northern Mexico, like the southern U.S., is stereotyped as a conservative area. The government shows its willingness to maintain that stereotype through lies and military intimidation in schools. Among those still detained, the case of Jacquelyne Santana and her partner, musician Brian Reyes, is noteworthy. They were kidnapped by federal police as they left their home on November 15. On Monday, January 12, relatives and students of Ayotzinapa went to the entrance of the barracks of the 27th Infantry Batallion in Iguala. They first demanded to be allowed to enter and look for the missing students. The entrance had been reinforced with barbed wire, which the protesters tried to take down. When they were not able to do so, they commandeered a Coca Cola truck which they used to break down the doors and enter. [See dramatic video of this incident here.] They continued to confront soldiers for, reportedly, about 15 minutes and seized a Corona beer truck to use the bottles as missles. Several protesters, apparently including Omar García (cited above) were injured. Similar but less intense protests occurred in other parts of Guerrero and in other southern states, including Oaxaca, Michoacán, Morelos, and Chiapas. Liberal commentators like Carmen Arestegui MVS Radio in Mexico City are preoccupied with the level of “aggressions on both sides” but demand that the government facilitate public inspection of military facilities. Monday, January 26, will be a national day of protest in Mexico for the missing students of Ayotzinapa. This entry was posted in RagBlog and tagged Ayotzinapa, Guerrero, Johnny Hazard, Mexican Massacre, Mexican Protests, Mexican Student Movement, Mexico, Miguel Ángel Mancera, Official Oppression, Rag Bloggers, Sandino Bucio. Bookmark the permalink. All this isdone simply to avoid paying a living wage and maintaining slavery forthe gringos, one arm is the US guns and the other is the cath church –wherever they go they are evil and greed personified– the indiginous are not. Then blame the ‘Drug Capitali$ts whose money US banks love to wa$h!